Binay treats typhoon victims at Jollibee: Strictly no spoon and fork? 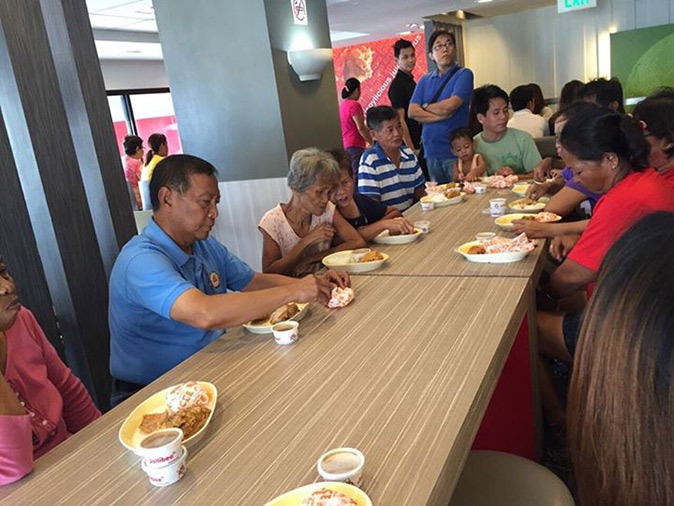 Home / news / photo / viral / Binay treats typhoon victims at Jollibee: Strictly no spoon and fork? Vice president Jejomar Binay treated some typhoon victims in Nueva Ecija a free meal at Jollibee. But a few things were lacking on the table. A photo, which the presidential aspirant posted on his official Facebook page on Tuesday, October 20, shows him dining with a group of residents who sought refuge at the evacuation center in typhoon-hit Guimba town. Notice that they did not use utensils despite the fact that the fast food restaurant offers the same to customers at all times. Also, no water or softdrinks were served. Apparently, it's a strategy of Binay's camp to maintain the politician's "makamasa" (favoring the masses) image, but many were unappreciative. View the memes and negative remarks on Facebook, or simply hit this link. Binay's critics online said it was an act of "hypocrisy" not to use spoon and fork when these are readily available at Jollibee.